Looking At The Tailless Manx Cat Breed? The Manx cat breed is a quiet, yet playful cat. They are said to be almost dog-like, and even bury their toys. Many can be taught to come when called, or play fetch. The typical image of a cat, of course, includes a tail, right? Well, these cats would be the exception, of course! In fact, only tailless Manx cats are of show quality. There are some members of this breed, however that do have tails. They are affectionately known as stumpies or tailies. 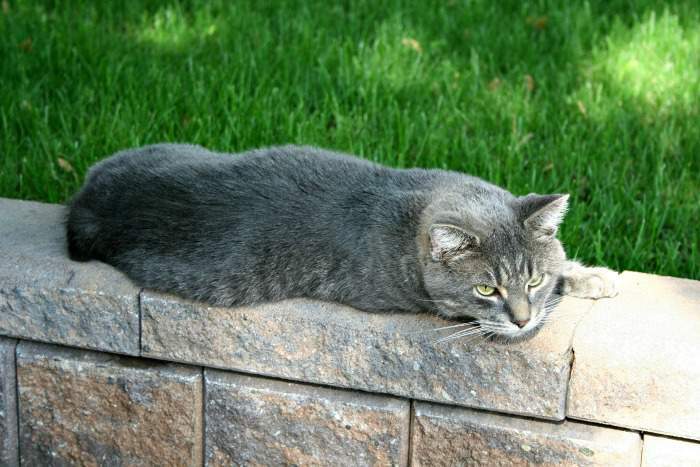 Whether tailed or tailless, these cats make great pets for almost any household. The ones that are not tailless just cannot enter the show ring. The Manx cat is an old breed that was developed before the seventeen hundreds on the Isle of Man. They have a funny walk and are said to hop like a bunny. This is because this cat has longer legs in the back than in front. There are a couple of legends surrounding how the Manx lost her tail. One says that the mighty Samson used to exercise by swimming in the Irish Sea. During one of his swims near the Isle of Man, he almost drowned during a struggle with a swimming cat. Samson had to chop off the cat's tail in order to get away, and the Manx remains tailless to this day. Another legend says that Noah was too quick to shut the door, and pinched off the cat's tail. When standing still, these cats will usually hold their back legs bent a little, so that their backs are still fairly straight. They have a small, rounded body with a solid build, weighing anywhere from eight to twelve pounds. The Manx's head is wide and slightly rounded. The face displays prominent cheeks. They have long ears, which are slightly rounded at the tips. The eyes are gold or amber and are very round. They are related closely to the British Shorthair. Like the Shorthair, the Manx breed can be seen in almost every color and pattern available. The Manx is normally a quiet and gentle house cat. They have a very sweet demeanor and playful nature. The gentleness of this breed makes it a great choice for families. They are very versatile, however, and these cats are also a good choice for people who spend a lot of time at work away from the house. These cats don't dislike the company of other cats, but they also don't need a playmate to feel like their lives are fulfilled. Children, as you might imagine, enjoy the playful and engaging nature of the Manx. Most cats, as we know, are excellent jumpers. The Manx has a lot of spring in those longer back legs which enables it to actually leap higher and farther than most cats its size. Often, these cats will find a high place to perch, such as above doorways or on top of refrigerators. This breed, as a whole, is said to have dog like traits. In dog fashion, the Manx will often bury or hide its toys. You should be able to teach your cat some tricks in pretty short order. Coming when she is called, and games of fetch will come easily to your Manx. Given their quiet nature, these kitties are excellent apartment dwellers. So, if you are worried that the neighbors will be disturbed by your cat, this breed should put your mind at ease. These cats typically do not meow too often. Of course, neighbors who are disturbed by a cat should be traded in for better neighbors. Other than tailed and tailless, this breed comes in two other flavors, longhair and shorthair. The shorthair has a rather thick coat, and the longhair has a silky quality. Fairly minimal grooming is required to keep either variety in top shape, but longhairs are almost always more work. In some registries, a semi-longhaired variety of the Manx is considered a different breed, called the Cymric. Other names are Longhair Manx, Semi-longhair Manx Variant, or long-haired Manx. A good brushing of your cat's coat about once a week should be enough to keep her hair in good condition. I would recommend more, of course, if you and your cat can take it. The extra attention and the hairball prevention are both good for your cat, and you. Whether they be show quality tailless or pet quality tailies (with tail), long or short hair, this is one fine pet. Maybe there's one out there just for you.